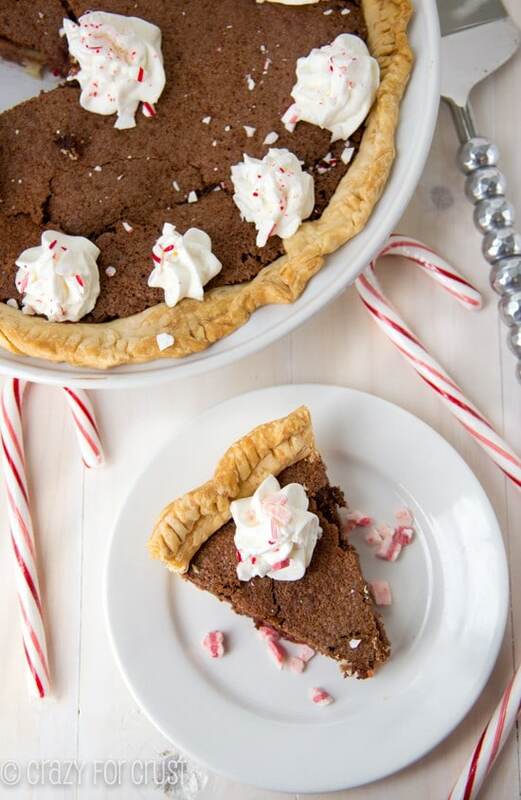 Peppermint Chocolate Chess Pie: the perfect pie for peppermint season! I am totally not winning the responsible mom award for Christmas this year. I let Jordan watch National Lampoon’s Christmas Vacation. She loved it. I sat watching on edge, waiting for the next swear word. I’d kind of forgotten how many f-bombs are in that movie. I only had to hum loudly a few times. And make her cover her eyes twice. #momwin by Jordan’s standards. #momfail by most parenting standards, I’m sure. Oh well, when I was her age I was watching Golden Girls. So, somehow, this seems better. 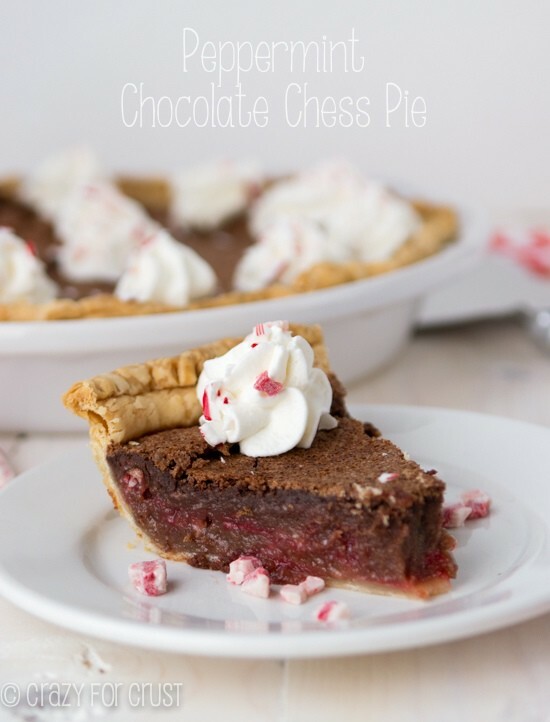 That leads me to this pie: Peppermint Chocolate Chess. It tastes like a rich and indulgent mug of peppermint hot chocolate…but in a pie. With a crust! Now, if you think you’re crust challenged, or if you are just scraped for time (who isn’t?) then you can use a Pillsbury crust. Or, if you feel like making the real thing, go for a from scratch recipe. 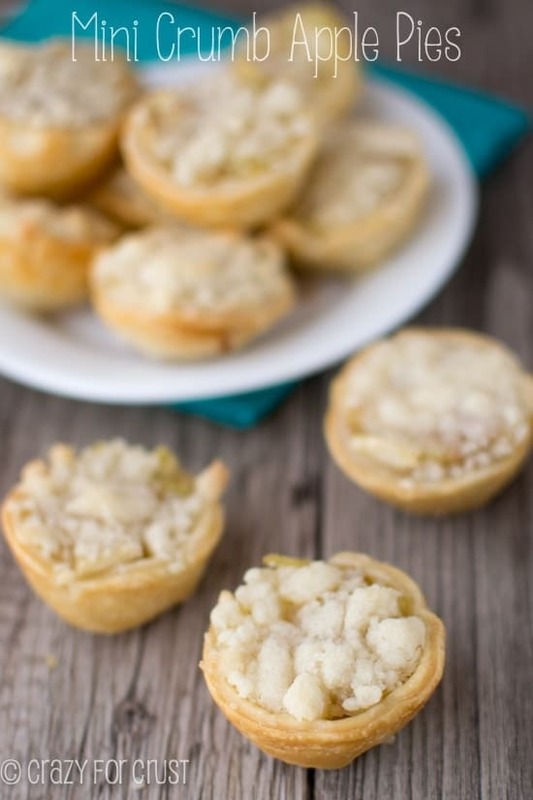 I have a tutorial here for an all-butter pie crust. Peppermint Chocolate Chess Pie. This is a combination of two amazing things: peppermint and chocolate chess. You know about chess pie, right? I made a peanut butter chess version at Thanksgiving. This is my chocolate version. It’s an egg-based pie but it’s baked so it sets. It’s not a custard-like pie, this is more like a brownie in texture. I used Andes Peppermint Crunch Baking Bits. They come in a red bag, in the candy aisle or holiday baking aisle. I know they have them at Walmart. If you can’t find the bits, they also sell the candies (they look like Andes Mints, but in red packaging) in the holiday candy aisle. They just need chopping (one package is about 1 cup). If you can’t find those, you can use regular Andes mints. Or any peppermint bark candy you can find. Ghiradelli, Guittard, Williams-Sonoma, Hershey’s Kisses, Nestle. Anything that is peppermint and can be chopped up and added to the pie will work. This is one of my favorite pies of all time. Preheat oven to 350F. Unroll pie crust and place it into pie plate. Chill until ready to fill. Whisk butter and cocoa. Whisk in eggs. Add sugar, salt, vanilla, and flour and whisk until smooth. Gently whisk in milk. Stir in peppermint crunch baking pieces. 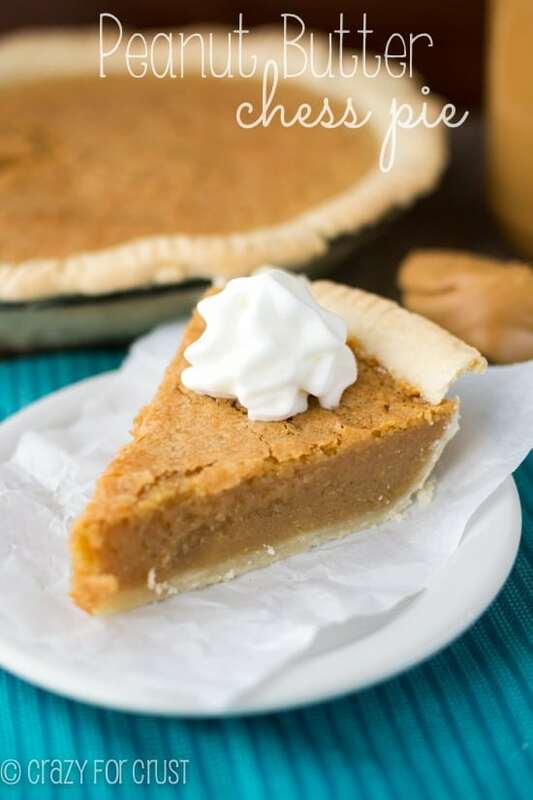 Pour batter into prepared pie shell. Bake for 40-45 minutes until it’s just slightly jiggly in the center and no longer dull on top. Cool completely before topping. 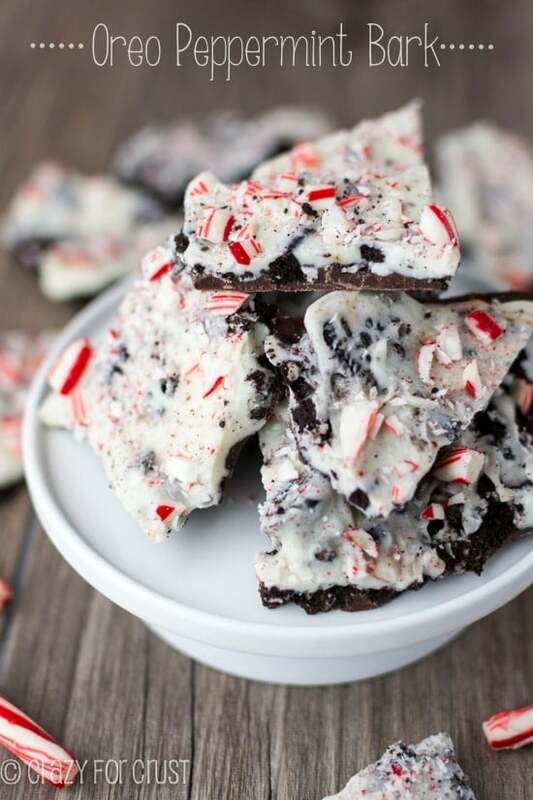 Serve with whipped cream or Cool Whip and more peppermint crunch pieces and/or crushed candy canes. I find the Andes Peppermint Crunch baking pieces at Super Walmart. They also sell the Peppermint Crunch patties (like regular Andes mints) at the grocery store in the holiday section. If you cannot find them you can use regular Andes mints, or any peppermint bark candy (like Ghiradelli, Nestle, or any brand you find). Trust me she will remember watching the movie with you over the bad words 🙂 This pie looks delicous as usual. Thanks for sharing. Would this work in a stand mixer, or do you think it would change the texture? Love your blog! The crust? I think you can do it with the paddle attachment, to a point. Then you’ll have to use your hands. The filling you just stir by hand with a whisk. It’s just a liquid! 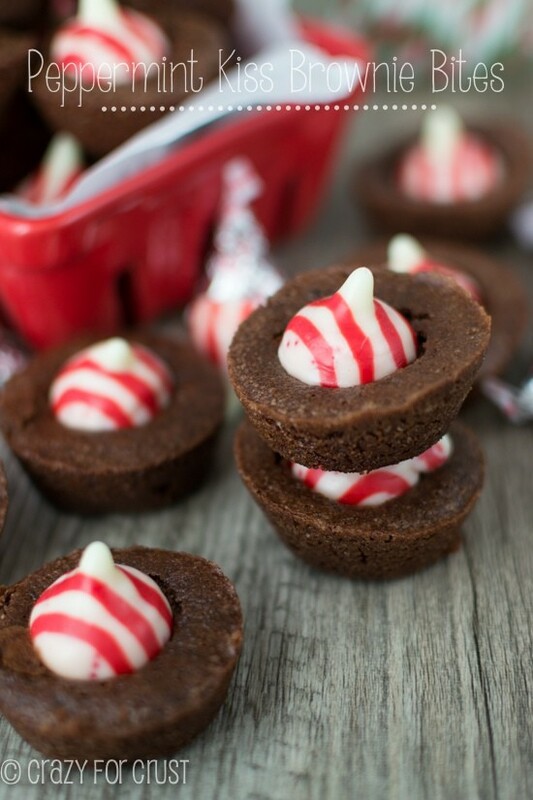 Chocolate + Peppermint = best Christmas desserts ever!!! I love this pie so very much! Oh, and would you believe I have never seen that movie? What a fun version of chess pie! I love how the red of the peppermint comes through – so pretty! I think it went right over her head too! I’M OBSESSED with chocolate chess pie, especially with this lovely peppermint twist! The perfect thing for the cold, snowy day we’re having in NYC today! 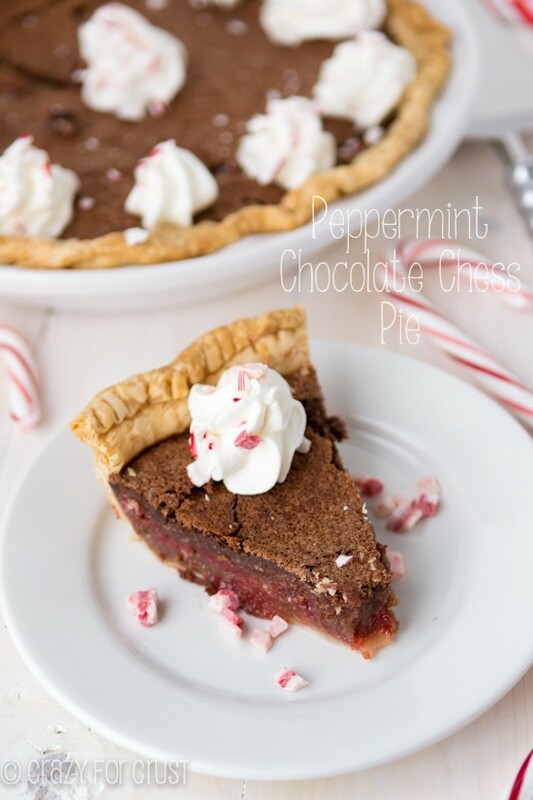 Peppermint chocolate combo in a pie sounds like the perfect treat to have this holiday season. And watching “Christmas Vacation” of course! LOL! I’m that way too right now! The whipped cream with the chips stirred in looks amazing. I just want to eat a pie plate of that! Chess pies are the best to impress and this chocolate peppermint version does not disappoint! After Eight mints and it turned out great. Thank you for posting! I’m so glad Cate!!! Yay! Thanks for reading!